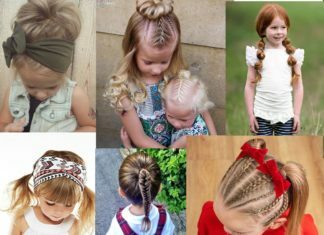 While an uneven haircut might send most people running in search of a new stylist, for some it’s a deliberate decision that can have amazing results. An asymmetrical bob style will frame and flatter your face much the same way as a side swept bang, and by drawing the eye down and to one side, roundness in the cheeks or a square jaw can be downplayed in an instant. 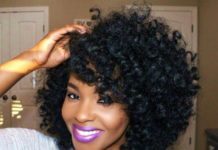 While some women feel an uneven cut is too edgy a choice for their professional workplace or laid-back style, there are plenty of soft and subtle ways to reap the benefits of this hairstyle. From boldly shaved sides to pin straight lobs and everything in between, these asymmetrical bobs will have you believing in the surprising power of putting a little slant on your next hairstyle. Lucy Hale is wearing a super sleek blunt bob, that is slightly asymmetrical as it is longer in front. 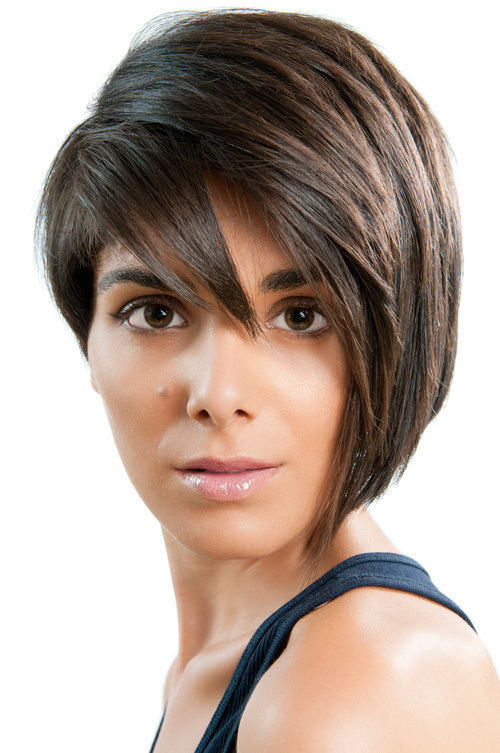 This classic and chic look can work on most hair types and face shapes. This Umbrella-era hairstyle came right as Rihanna was propelled into superstardom, making this sleek, asymmetrical bob one of the most sought after hairstyles in recent memory. Chin length on one side and shoulder length on the other, this dramatic style looks perfect with both trendy and classic wardrobe choices, and won’t look out of place in professional environments. While asymmetrical bobs often lean towards the dramatic and edgy, this softly curled style is proof that they can also be a romantic choice. 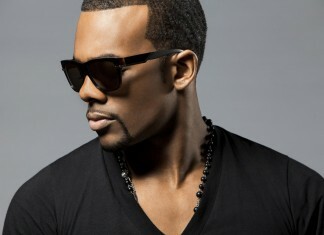 In this look, a subtle difference in length helps to accentuate long pieces swept across the forehead. This dramatic, avant garde style is not for the faint of heart, but may be the major hair change you’ve been looking to make. 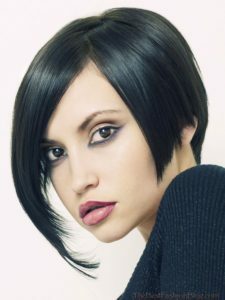 Steeply angled from back to front, this asymmetrical bob is chin length on one side, while hitting just above the ear on the other. A stunner when it’s styled into place, this cut will mean saying goodbye to quick and easy updos. 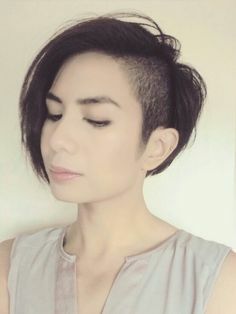 While shaved sections of hair have been popular with women sporting very long or very short hairstyles, the trend is just starting to take off with bob and mid length cuts as well. You can’t get much more asymmetrical than this impressively daring, yet surprisingly feminine, style. 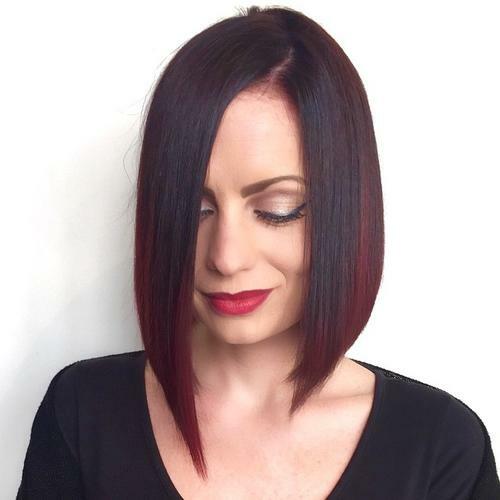 If you want to keep people guessing as to whether you’re a perfect angel or a sultry vixen, try this two-level bob that’s perfectly coiffed on one side and long and texturized on the other. Half pixie and half bob, this style requires a fair amount of texturizing to keep it from looking helmet-like. For days when you’re short on styling time, try french braiding the longer side to create a modified updo. If you’re looking for a style that’s subtle in its asymmetry but bold overall, channel Rita Ora with this choppy platinum look. The side swept bang seen here works with almost any face shape, but you could substitute it for a blunt bang if you’re feeling extra brave. A little bit of asymmetry adds some extra interest to your lob hairstyle, and works for both blunt cuts or those with layering and texture. 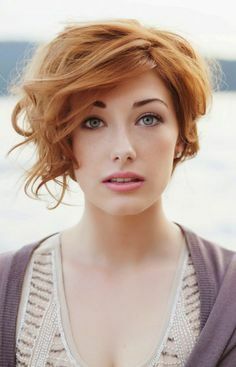 With asymmetrical sides and tons of different angles in play, this unique style should be executed by a trusted stylist who’s shown you they understand your specific hair type. 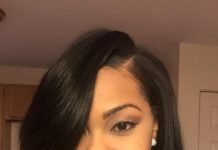 If you love the face framing features of hairstyles with bangs but don’t feel that a blunt or straight across fringe will work with your face shape, try this long bang that sweeps across the face from a deep side part. This red carpet look from Zoe Saldana mixes the retro feel of big waves with the modern trend towards asymmetrical cuts. Complete with a red lip and high-necked dress for a classic look, or onyx lips and monochromatic streetwear for something more trendy. 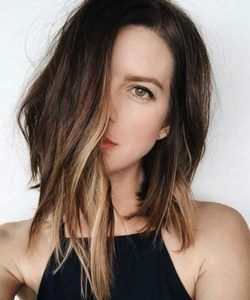 Thanks to love from celebrities and its relative ease to pull off in real life, the long layered lob continues to be a hugely popular hairstyle. 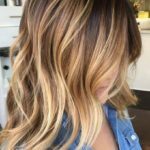 Add in some face framing ombre colour and a little bit of asymmetry, and you’ve got an updated version of everyone’s favourite cut. 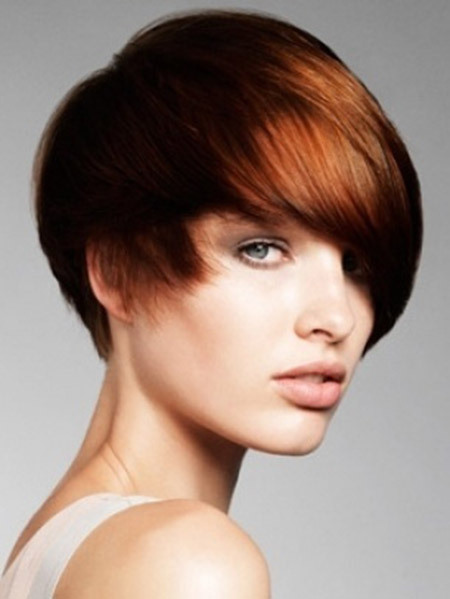 This high fashion hairstyle puts a feminine twist on the bowl cut. With differing lengths on each side that help to modernize the haircut and softly frame the face, nobody will mistake this style for a home haircut. Keeping her golden locks looking smooth and sophisticated, Charlize Theron’s glam style makes the asymmetrical sides of this cut look like a happy afterthought. While we’re used to seeing the ultra trendy long bob styled straight with a few face framing waves, Cheryl Cole’s version is a high volume look that’s more vixen than your everyday style. If you’re worried your hair will look flat, copy Cheryl’s colour strategy by leaving some darker roots visible. 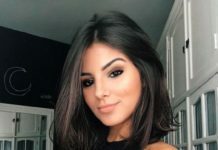 If you love the look of a long, heavy bang that sweeps across the face from a side part, but feel like you’ve got too much hair to wear this style well, try going for a dramatic asymmetrical look where one side is very short or shaved. 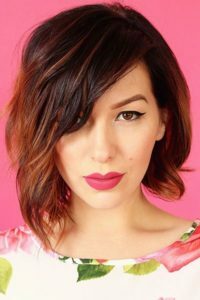 If you’ve got naturally wavy hair, this flirty bob that hits somewhere between chin and shoulder is the perfect length to show it off without requiring too much styling time or product. For women who want their hair to be anything but subtle, this style features bangs that are cut straight across at a steep angle and tiny pieces left longer throughout the top layer. As one of the shorter styles we’ve seen Beyonce wear, this sleek bob doesn’t disappoint. Between the darker roots for added dimension and longer length on one side, we can’t imagine a better looking bob. So asymmetrical it’s only half a bob, this style adds some shorter bangs in front to make it more wearable on a day-to-day basis than haircuts with a long, heavy bang swept across the face. Think of this as the go-to style for women who are big on asymmetry but short on time. With hair that angles in length towards the front and is longer on one side, the ends of this sleek style create a beautifully curved silhouette that will make it worth straightening into place every morning. 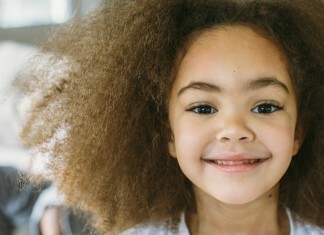 And if your hair is naturally straight to pull this off on its own…what are you waiting for? 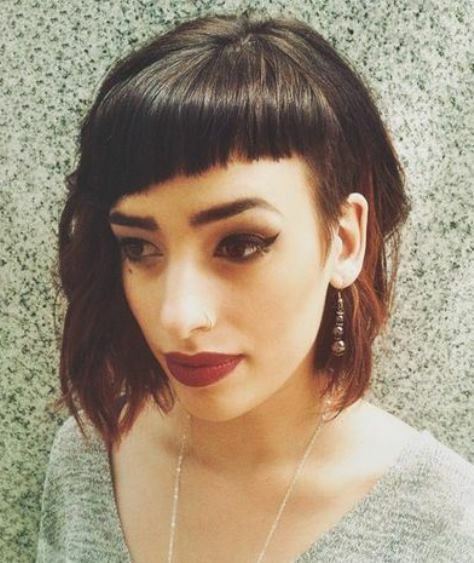 The slight asymmetry from side to side in this cut is overshadowed by the bold awesomeness of these diagonal bangs and accompanying undercut, and is a perfect style idea for women who love wearing short bangs but are looking for something new. 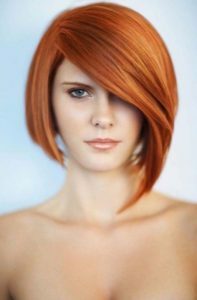 Featuring one of the most dramatic length discrepancies on our list, this hairstyle looks like a typical chin-length stacked bob except for the long pieces in the front. 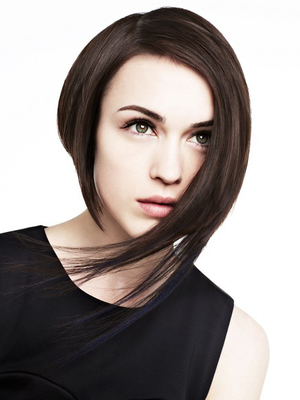 If you’ve got thick hair, be sure to ask for textured ends in the long pieces to keep them looking light and wispy. 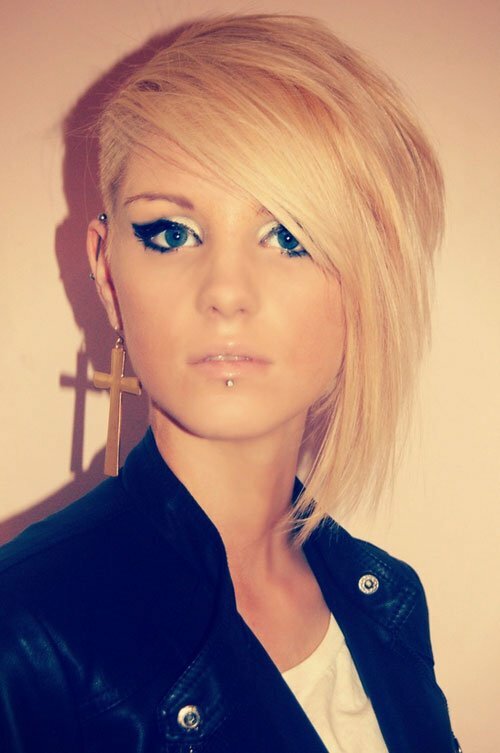 If a shaved side style isn’t bold enough for you, try adding a contrasting colour to your shorter hair. If you plan on keeping up the shaved side style, this pop of colour is surprisingly low commitment, and can be gone the next time you go for a trim. 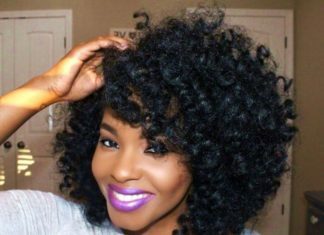 This chameleon-like hairstyle can go from Saturday nights out to Monday mornings at the office without skipping a beat. Short on styling time? Try a french braided updo for days when you don’t have time to blow dry and flat iron into place. A surprising departure from the waist length hair of her Simple Life days, Paris Hilton looks polished and mature in this asymmetrical bob. With plenty of face framing layers and textured ends, this wearable style looks just as good on non-heiresses. If you want a bob for the day but not the foreseeable future, try styling your longer hair into this tucked-under faux bob. 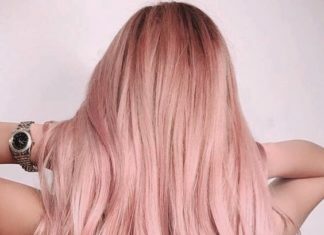 By pulling the hair back on one side and leaving some pieces loose on the other, your hair looks softly arranged rather than forced into place. 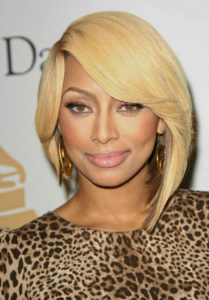 Keri Hilson’s dramatic long bang doesn’t overpower or hide her face thanks to this modern take on the feathered texture of ’70s popularity. 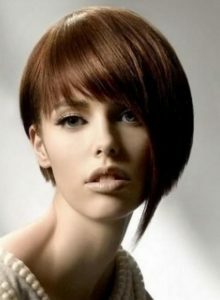 This shorter style is mostly even in length except for a long piece that’s formed from one side of the textured bangs. Unlike side swept bangs that come across the face from a deep side part, this style creates a round silhouette that gives off retro, pageboy vibes. Put together with deliberately messy styling, this look is the free spirit’s answer to the sleek and polished bobs on our list, and is the perfect haircut for brave women who cut their own hair (or want to look like they did).